In the ideal case, you would have 5 Physical Servers to install the native ESXi, and a Physical Switch. Since the majority of us do not have an infrastructure like this just lying around, we need to do an alternative approach: Use 1 Physical Server (needs to be packed with RAM, Memory and CPU), and build the Nested ESXi-s to simulate the target environment. Minimum 32GB of RAM. With 32 you will be “on the edge”. It´s recommended that you have between 48 and 64GB. Minimum 512GB HDD (SSD Highly Recommended). 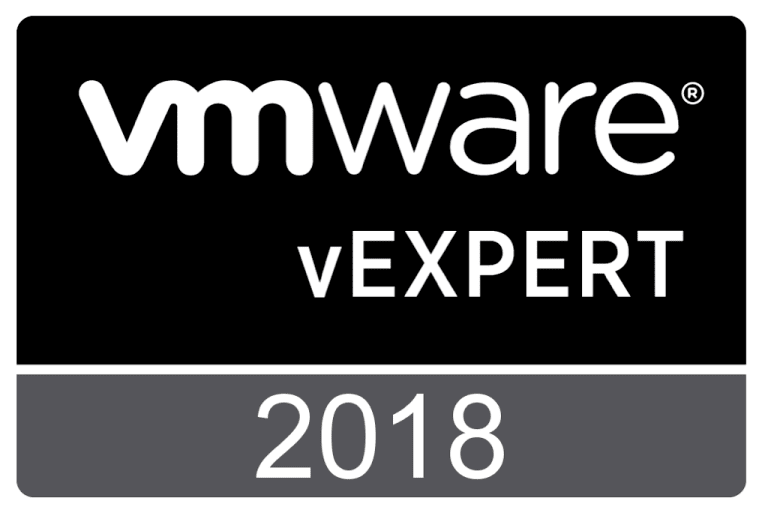 You will need more GBs for your VMs later if you want to test the functionalities, so it´s recommended to have 2x512GB or 1TB. I will only focus on Home Lab built directly on ESXi as the native OS. 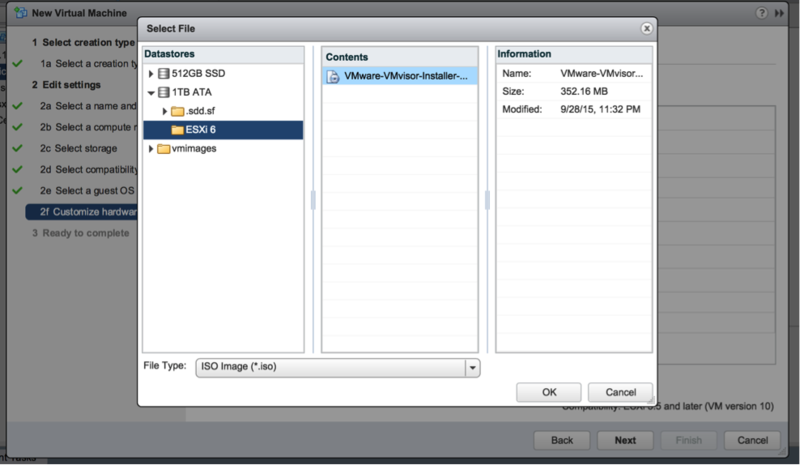 You first need to Install ESXi 6.0U1 as the Native OS on your Physical Server. In my case I have a HP Z800 with 48GB of RAM, 1TB HDD and 512GB SSD (I use SSD only for the entire HOME LAB, and then later when I install a bunch of Linux VMs in order to test the features - I use a 1TB disk [you need to create a Datastore using this disk, or it won't be visible]. 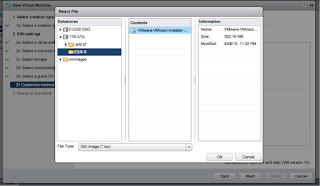 Install a vCenter 6.0 and connect it to the Physical ESXi. 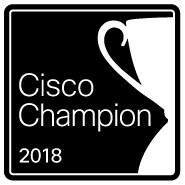 I assigned the Static IP to the vCencer: 192.168.1.78/24, with the GW 192.168.1.1. 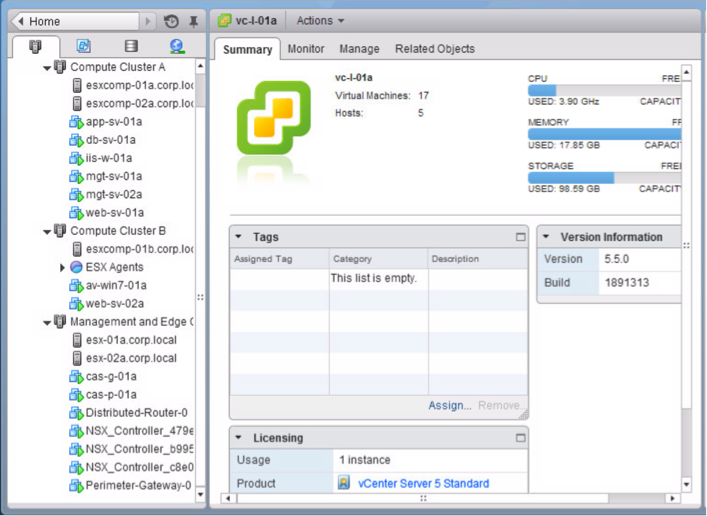 You should log in as administrator@vsphere.local, not as root. The difference is that the “root” user has the additional privileges to configure the authentication. Yes, this is better, but you should get used to use the “admin” account, because in the future you will be having the Admin set of privileges. 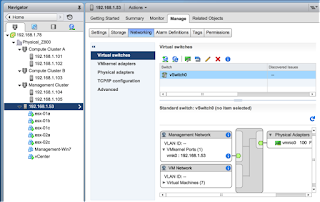 You now need to deploy your 5 Nested ESXi-s as the VMs with the ESXi 6.0 ISO. 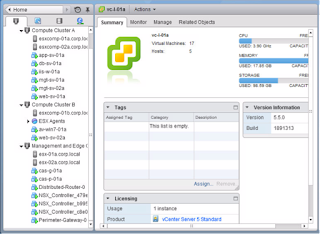 Before you start deploying the nested hosts you need to copy your ESXi .iso to a Datastore [just browse around, you´ll manage how to copy from a local PC to Datastore]. IMPORTANT: Be sure to assign at least 4GB of RAM to each host, or it will report weird errors afterwards. Sometimes these errors are random, I once got – Network Adapter not present. 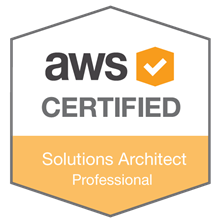 You should now build 3 clusters, MANAGEMENT, COMPUTE A and COMPUTE B (that’s EXACLY like in the HOL). 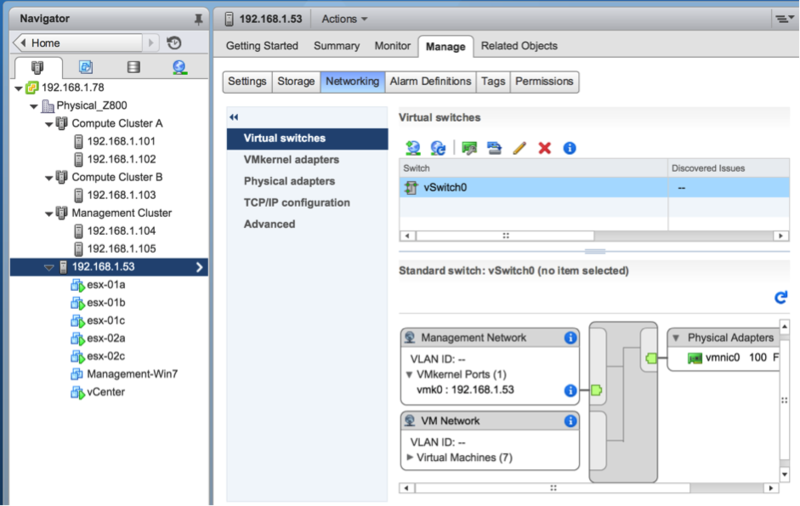 Have in mind that the management IPs of ALL ESXi should be STATIC, so in my case I assigned 192.168.1.101 - 105/24. IMPORTANT: You´re doing a Nested environment, so you need to set the Security settings within your vSwitch on a Physical Host to Accept the Promiscuous traffic. If you do not do this, the traffic between your Nested ESXis and the Physical NIC will be dropped (Rejected). 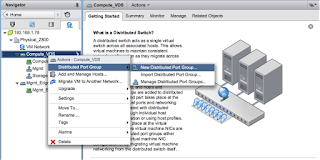 Virtual Distributed Switch is the basis of the NSX, and before we start with any of the NSX-related “activities” we need to deploy the VDS, and migrate all the 5 hosts ports to the VDS. 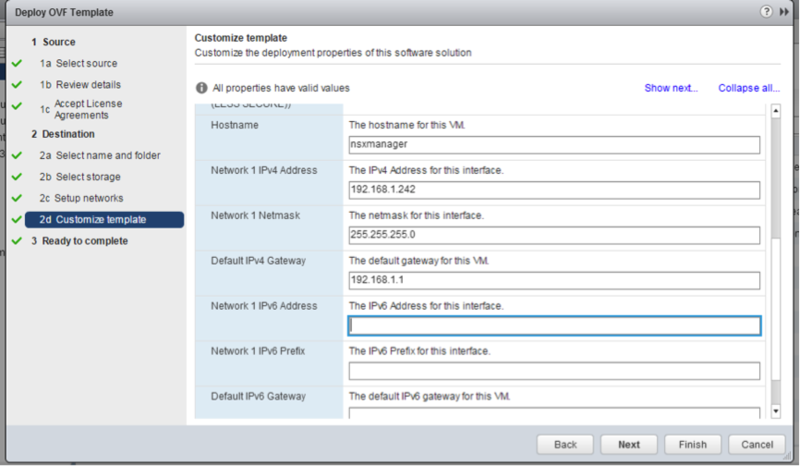 To create a VDS, you need to follow the simple procedure shown on the screenshot below. When prompted, select the VDS version based on your ESXi version (in my case I did the VDS 6.0), and choose the number of Uplinks that your Hardware allows. 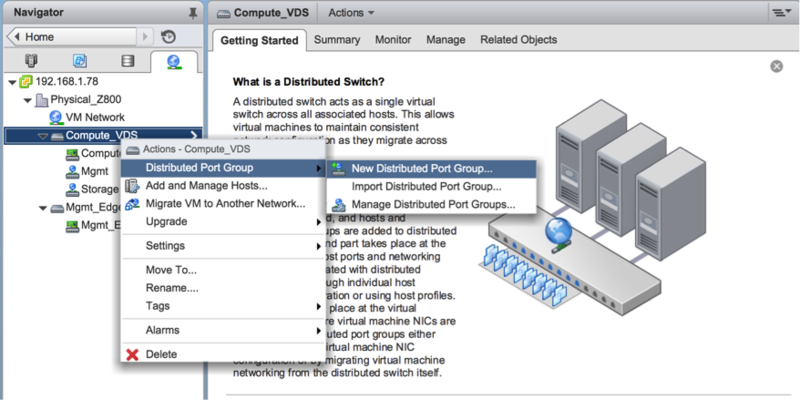 You now need to create the Port Groups, and perform a Migration of the existing Hosts from the vSwitch to the VDS. 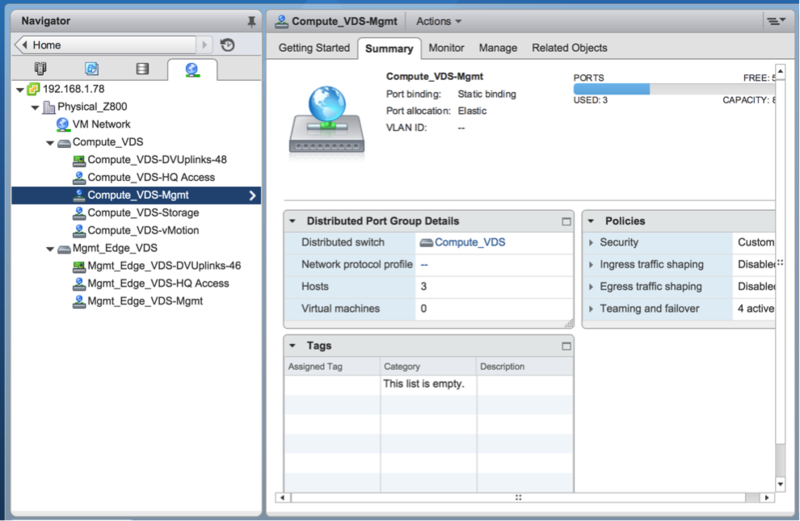 Once the port groups are created (Check the Screenshot below to see which Port Groups you need), go to “Add and Manage Hosts”, and migrate all the 5 Hosts to the corresponding VDS. Use the Mgmt Port Groups for the VMkernel network adapters. 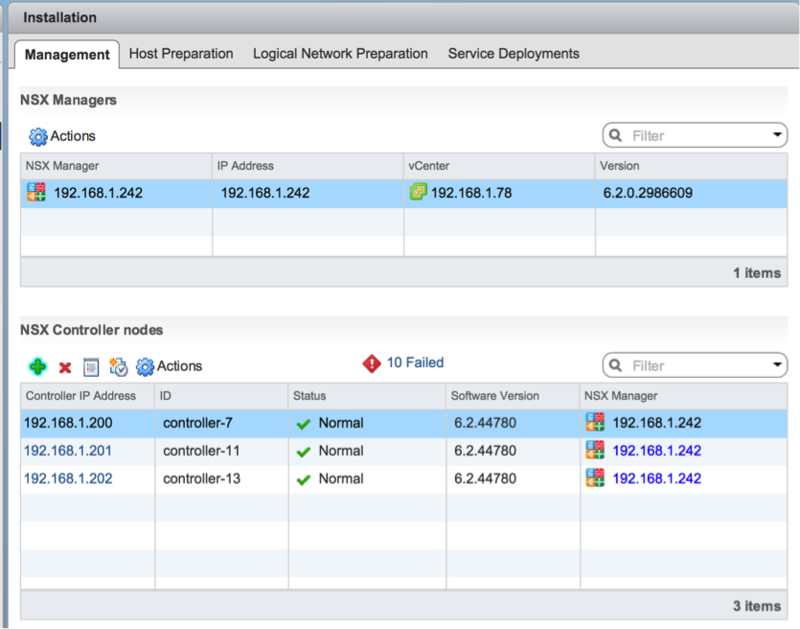 Before you install the NSX 6.2, consider your network configuration and resources. 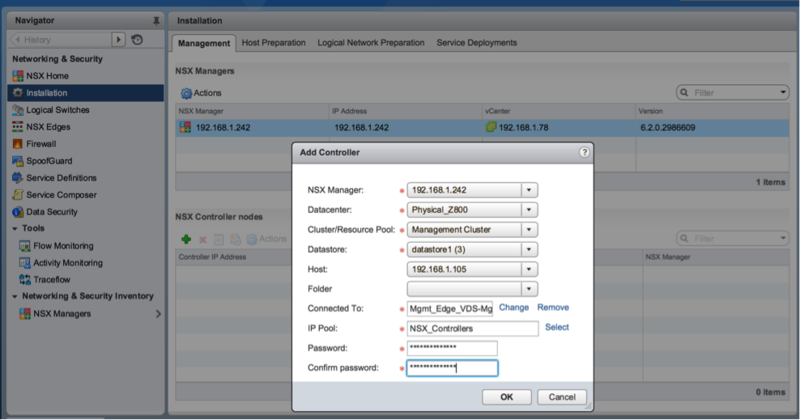 You can install one NSX Manager per vCenter Server, one Guest Introspection per ESX™ host, and multiple NSX Edge instances per data center. 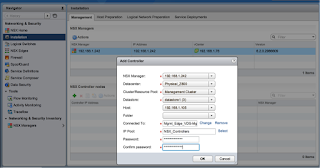 The first thing you need to do is enter the NSX Manager console with the username: admin and the password you configured when deploying the OVA. Logout from your vSphere Web Client, and log back in. You will the the new icon called “Networking and Security”. 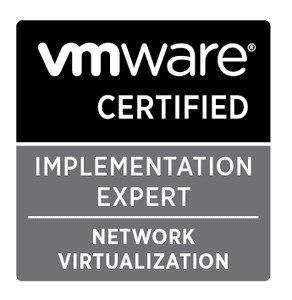 Congratulations, you have installed the NSX Manager, and connected it to your vSphere. 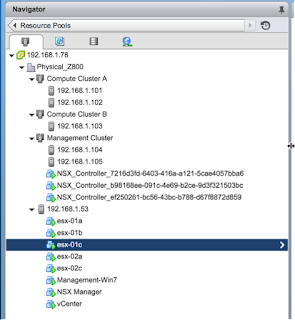 From the beginning we knew that we wanted to deploy 3 NSX Controllers, and that we want to do it in the Management Cluster. 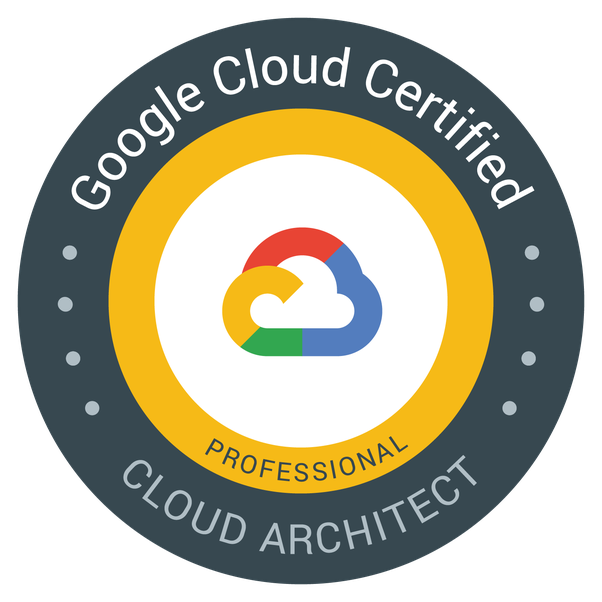 Since there are 2 Hosts in the Management cluster (.104 and .105), we will deploy 2 Controllers on one, and 1 Controller on the other host. We need to have 3 NSX Controllers because the Controllers use the VOTING principle to avoid the Split Brain. This means that if 1 Controllers stays alone, it will not be able to make any configuration changes. 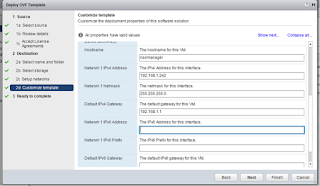 You need to create the new IP Pool while Adding the First Controller. 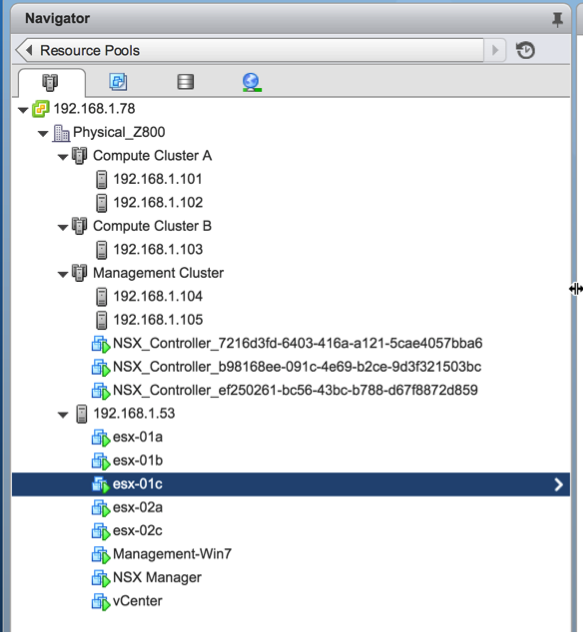 I called mine NSX_Controller_Pool, and assigned the IP range 192.168.1.200-192.168.1.202. 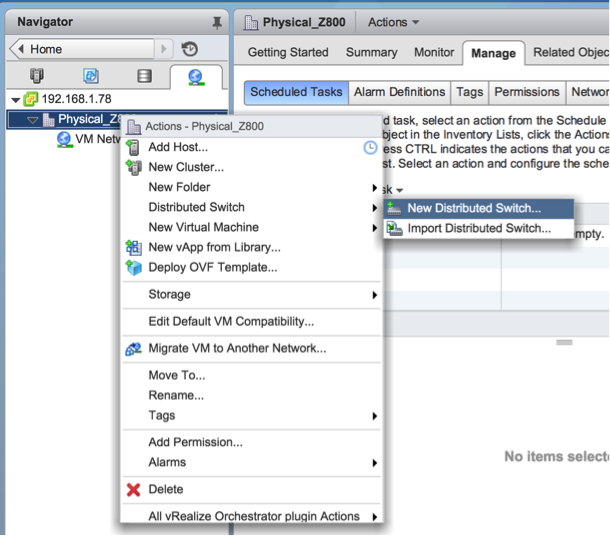 Have in mind that if you didn’t assign enough resources to your ESXi VM-s, the NSX Controller deployment will fail. On the screenshot below you can see that I had 10 failed attempts to deploy the NSX controller. Each time I had to go back, and tune the storage and the CPUs on the Management Cluster hosts. 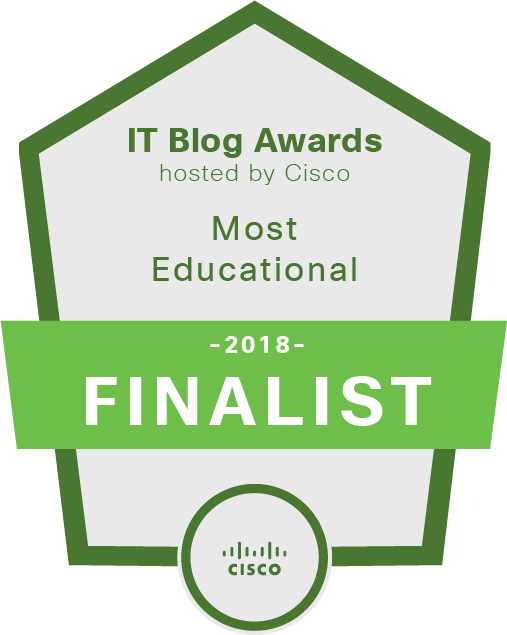 After this, you may use the HoL Workbooks to test the NSX Features in your environment.